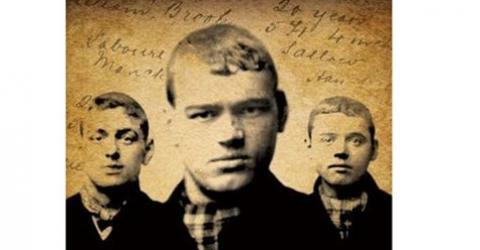 The Gangs of Manchester tells the story of the scuttlers, gangs of youths who terrorised the world’s first industrial conurbation in the late 19th century. Published in 2008 by Milo Books, it is written by historian Dr Andrew Davies. This website offers excerpts from the book, info on where to buy, extras, such as profiles of leading scuttlers, and information on the book, the author and the exciting developments arising from the book’s publication: press coverage, author appearances – and not least, a play being produced by the MaD Theatre Company! The book is a labour of love. It took seventeen years (on and off) to research and write. Most of the time was spent scouring back issues of the Manchester and Salford newspapers – these are held on microfilm in Manchester Central Library and Salford Local History Library. Thousands of reports on outbreaks of scuttling were copied, and sifted. Patterns in the reports slowly became apparent, and these form the basis of the chapters in the book. Additional material came from “depositions” – sworn witness statements, taken in preparation for the trials of scuttlers at the Quarter Sessions and the Assizes (the equivalent of the Crown Court today). These are rare: only a handful survive, but they provide intricate layers of incidental detail which can be added to information gleaned from press reports. Further evidence came from Salford Magistrates’ Court. The day registers of the court record every case tried by Salford magistrates in the late 19th century. A two year sample of these records from 1889-90 was entered into a database by Dr Claire Langhamer (now of the University of Sussex). Not surprisingly, the database is full of scuttlers – but many of them were prosecuted for trifling offences such as gambling at pitch and toss, or even bathing in the Bolton & Bury Canal! These records help to build up a picture of young people’s lives in the late nineteenth century beyond their involvement in gang violence. My father was born and brought up in Collyhurst. Indeed I can vouch for these stories as he told me of many similar ones. They had to be tough to survive and the women were pretty tough too, I remember my grandma she was product of this culture, coming from Ancoats herself. I suppose there will always be this underclass in society and they engage in this type of behaviour for many reasons, a couple being thrill and entertainment. I have just learnt of the publication of Andrews Davies book on the Manchester gangs, and I hope shortly to be reading it . My family forebears lived for 140 years(1780-1921) in inner Manchester, first in Angel Meadow, then in Ancoats and the Rochdale Road, and finally in Harpurhey. I have followed their movements and their intermarriages through often dreadful slum situations, and in the process have collected a large archive of photographic images and prints. Most of my research was done in the 1980’s, and I could do with some brushing up, but am happy to help any researchers. My father b. 1907 sometimes reminisced about gangs encountered around Harpurhey in his boyhood, and ironically when I visited the area in 1983, in view of some new but recently firebombed and abandoned blocks of flats I received warnings of the presence in the neighborhood of knife-wielding and extremely violent ‘kids’ roaming the area in gangs. I hope you enjoyed the book i am waiting for it to be delivered as i write and can’t wait to start on it.. The reason i am contacting you is you said you had a collection of photographs and prints, there is a site on Facebook called Collyhurst Forever with lots of photo’s and comments about the area i am sure you would like the site there is also a Ancoats and Miles Platting site.